If you’re lucky, you still have your favorite leather jacket—maybe you even wear it every day. I sometimes pine for mine—it was a ’70s-era Schott I bought in a used clothing store. It looked, fit and felt just right, but I sold it to buy a brand-new Vanson suit, as the Vanson’s protection, durability and features were inarguably far superior. 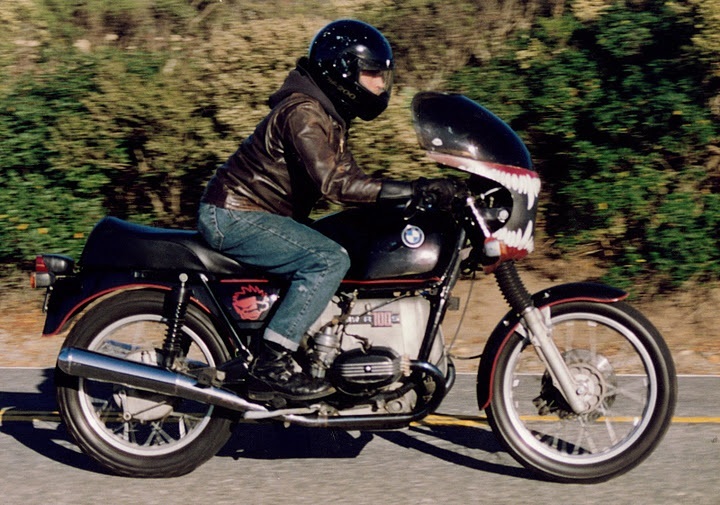 A succession of riding gear has followed, and though every year brings new innovations in safety or comfort, it’s hard to find a jacket that has the soul of that old brown Schott. If a jacket is comfortable and stylish, it usually sacrifices protection, and if it’s protective, it isn’t the kind of thing you’ll want to wear out to dinner or taking the kids to the park. Luckily, there are enthusiasts who share our desire for a stylish, comfortable, functional and protective jacket that is built to last. One of them is Roger Sgarbossa, General Manager for Roland Sands Design. RSD—known for building eye-popping customs that touch on not just choppers and bobbers, but also roadracers, cafe racers and even supermotos and dirtbikes—wants to expand its operations past designing and building customs, so riding apparel seems like a logical next step. Hang around moto-apparel designers or manufacturers and it will be about five minutes before you’re talking about materials. Roger, like Andy Goldfine of Aerostich or Helmut Kluckner of Helimot, is a serious fabric nerd, somebody who can talk for hours about different leathers and textiles. Sgarbossa tells me RSD’s riding apparel lineup—which will include boots, gloves and other items—will use made-in-USA materials like waxed tent canvas and wool as well as Indian and Indonesian leather. The domestic materials don’t just look, smell and feel right, they also offer shorter lead times and smaller minimum orders, which allows RSD more flexibility in bringing its burgeoning apparel line to consumers. The motorcycle industry has few cool, small, upcoming brands, Sgarbossa tells me, because “there’s no distribution model for it.” Apparel lines are handled by a small number of large distributors (who only want to deal in thousands of jackets, beyond the scope of most small manufacturers), and most shops can ill afford to stock a lot of different brands, or even many styles or sizes from any one brand. Are the identical-looking Chinese-made jackets from four or five big brands the best thing on the market—or just the only thing available? What is available is the buttery-soft jacket RSD sent me, and I like it a lot. The cut, fit and features are unique. It’s loaded with pockets, both hand-warmer, breast, sleeve (for change and toll money) and interior stuff pockets. It has an extended back, zippered side gussets so you can add extra layers, underarm venting, zippered sleeves and a soft, silky liner embossed with RSD logos and graphics. RSD doesn’t want to build racing gear, but understands you may want more protection than a fashion-oriented jacket may offer. The Ronin has armor pockets designed for low-profile armor (that will be available from RSD soon) that accepted some basic CE armor I filched from some other apparel I had hanging around. Also, the soft pre-washed waxed leather is 1.2mm—not roadracing weight, but it should be far better than a sweatshirt and will probably outperform some textile riding gear. All the major seams are double stitched, which is much better than the single stitching you’ll find on most fashion apparel, but the multiple seams on the fashionably segmented sleeves make me nervous. Sgarbossa acknowledged they’re not as strong as you’d find on a race-grade item, but still offer plenty of protection, especially for street riding. Harry Hurt found that the great majority of street crashes happen at under 30 mph, which means you probably (hopefully) won’t experience the long street-Luge style backslides I’ve had on the racetrack. The Ronin fits a lot like my old Schott, although the sizing runs small—I went up a size and although the sleeves are a touch long and the chest is a little baggy, it’s a pretty good fit. The leather breaks in almost instantly, blocks wind the way leather is supposed to (except where it’s perforated, of course), and feels like you’ve had it a million years a few miles into your first ride. It’s not perfect, though—the collar bit into my neck and the baggy cuffs bunched up, making it challenging to put gauntlets on. But it looks great, and got me plenty of compliments, especially from the over-40 crowd. At $590, the Ronin is priced higher than your average moto-shop boy-racer jacket (although the other jackets are much less), but it has a special feel that makes it worth the extra dough. That higher price gets you a bit of handmade exclusivity that’s hard to find these days, and if this jacket turns into your go-to leather that goes with you everywhere, on and off the bike, you’ll quickly amortize the extra money you spent and be left with an item of apparel you’ll enjoy for a very long time. “Everybody’s got that go-to item of gear,” says Sgarbossa, “It may not be the latest, or greatest, but it’s just my stuff.” The Ronin seems to fit that description, and it will hold that place in my wardrobe until somebody sends my old Schott back to me—and I lose 15 pounds. 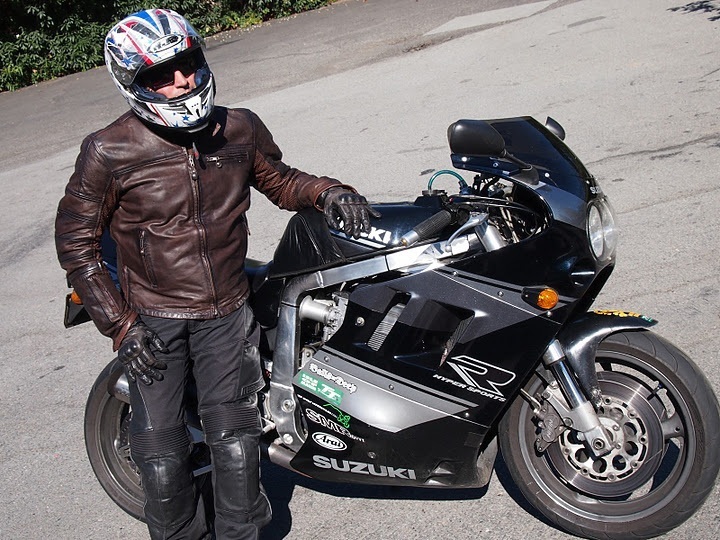 Thanks, Jeff Latta for the use of your old GSX-R as a prop. Check out RSD’s line of jackets, shirts, hoodies and now gloves at the RSD website. I'll never wear that old Schott again, but the RSD Ronin jacket gets me pretty close. The countdown to World Ducati Week 2012 starts now! I checked their website out and noticed (IMO) the Smoke colored version was much more interesting than either the brown or black. I also was noticing what seems to be far too many seams on the arms of this jacket. At least “too many” if you consider that each seam is a potential failure in the event of a crash and slide. 6) This jacket looks like it would be hot on hot days and cold on cold days…..?? huh? I mentioned the seams on the sleeves in my story–I agree, but Roger remarked that it’s still pretty strong, and RSD also sells a jacket with solid sleeves. Those are good features, but remember this is not intended to be a technical jacket–think of it as a fasion jacket you can feel good about riding in. Great looking jacket. Where’s it made? I’ve got a second hand store import jacket that I have to wear for just messing around/night out. These expensive jackets have to be watched like a diamond ring or they seem to disappear, it’d sure stink to have one make it to someone elses closet. The jacket is made in India! Sorry about the omission of that detail. That jacket does not go with those leather riding pants. It’s really only meant to be worn with jeans and a 3/4 helmet. Looks really awkward otherwise. Also, not very good value for the money they are asking. …or non-racer leather pants. Straight leather jeans or leather pants with accordian panels on the knees. You are right, but I don’t like to wear jeans when I ride! Or 3/4-face helmets. I’ve crashed too many times to scrimp on protection. I’ll leave that look to the Hollywood celebrities and fair-weather riders. As far as value goes, we pay more for things we like and can’t get anyhwhere else–this is a unique product and $600 isn’t that much for a jacket of this quality. Don’t know why you’d get this over a Vanson. I second the recommendation for Rev’it gear. By far the highest quality gear I’ve ever had. Most everything else in comparison seems low tech or dowdy. It’s top notch stuff, and if you ride, you owe it to yourself to check it out. 590 dollars is way beyond Chinese genericlone and into top-end Rev’it or Dainese territory. These brands have retro-stylish jackets available, including premium materials, modern armor and safety features; snide comments in the article aside there are plenty of very nice, non-Power Ranger-looking options available. Even if you only wreck at 30 MPH (or, heck, parking lot speeds) you still benefit from basic armor, and besides, you don’t buy safety gear for the best-case crash, you buy for the worst case. For that kind of money you shouldn’t have to compromise on protection. I’m curious about the comments on the distributor chain. While Sgarbossa has a point about brick and mortar shops being unwilling and unable to offer broad selections, I’d imagine the bulk of the market has moved to online vendors like Motorcycle Superstore, New Enough, Revzilla, etc. – or, in some cases, buying directly from the manufacturer’s online store (like RSD offers.) The smallest guys who can’t even swing their own storefront seem to be moving product via eBay. Sure, volume manufacturing is key for hitting the lowest prices. But for boutique dealers (like RSD) marketing on brand identity, premium features and style, the “cool, small, upcoming brands”, entry in the market should be a lot easier these days. Terrific points you make–thanks for posting. Thanks for the review! I’ve been considering this jacket, but, of course, none of the local shops stock it. Can you tell me where it’s made? Forget the jacket. How bout that old Gixxer! I was going to post this exact thing. Flat slides and velocity stacks, along with an old school SuperTrapp pipe? that bike is the nuts! Good eye on the GSXR. I had one and it was bloody fast. Thanks for the memory. The Gixer is not ’86. it’s an ’89. How do you know? See the 2 welds joining 1 curved frame? The ’86~’88 didn’t have a curve. Ok, good tip! Fuel vent threw me off,if they even had those in ’86?, thanks, always like to know what I’m looking at. Did Suzuki put male slider front forks on a `89 street bike ? 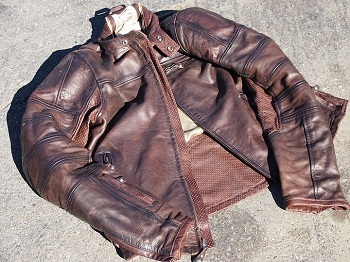 As far as the brown leather jacket………$600 for a jacket made only for 60-80F weather…….when pigs fly. 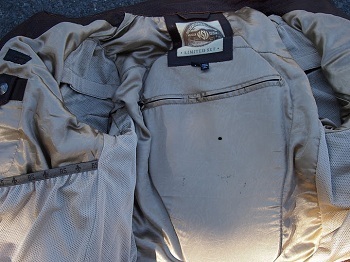 I got a perforated RR leather summer Fast Company jacket w/shoulder, elbow padding for $150 5? years ago. It’s comfortable up to 90F. After that temp. I wear my well ventilated padded textile jacket which is comfortable even @ 115F ! I think it might be a 91…carbs are stock, but Jeff had those bell-mouths made somewhere. Very fun old bike to ride. I too started off with a Schott – a bomber jacket back in 1980. 5 years into it and I went down in it. Of course I still have it; tears, abraisions and blood stains and all. It no longer fits or gets worn, but it has a place in my gear closet. I too upgraded long ago to a Vanson, then a fully perf’ed one and then a full race suit from them (Might as well have the Best). On a recent 2800 mile week long trip, I was wishing for a “Top-Shelf” Textile with breathability, water proofing, venting and warmth layer for the many changing riding conditions that touring brings. For a full day outing its either a solid Vanson or my fully perf’ed Vanson. I have an old Banana Republic (back when they made tough, cool clothes)Leather for non-mc riding use. I love a good soft leather jacket. I have one solid and one perforated leather in the closet. Seems like most of the gear I buy/wear these days is the newer high tech textiles with armor though.Lighter weight, better protection.